Why are retainers needed after braces? Orthodontic treatment equates many dental visits over an extended period of time. That monthly trip to the orthodontist becomes part of a regular routine. However, the one appointment that most of us have looked forward to is the one when the braces will be removed. However, that seemingly unreachable date is not the end of the treatment. There is still the very important matter of a retainer. Braces straighten your teeth, and once those wires and brackets have been taken off, it’s important to know how to keep your smile straight. A retainer gets the job done. A retainer is a small, customized device that is worn after braces are removed in order to reinforce the new position of your teeth. After all the time and money that have been put into braces, letting a beautiful straight smile return to its unaligned form would be a huge waste. After some time, it may be decided that you only need to wear your retainer at night. Your orthodontist, however, is unlikely to ever recommend that you stop wearing your retainer permanently. Wearing a retainer is a continued investment in your new smile. Failure to wear your retainer consistently means that tissues surrounding your teeth will be unsupported and noticeable shifting may take place. In short, a retainer allows you to maintain and keep that beautiful smile you worked so hard to achieve. 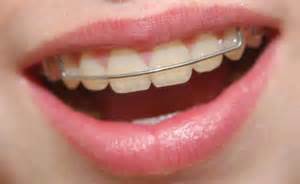 If you misplace the retainers or don’t wear them as intructed by your orthodontist, teeth willl shift back into their misaligned positions. The next time you try to put the retainer on, it may not fit due to the movement of the teeth. At best, you may have to be fitted for a new set of retainers, but there is also a possibility that you may need to start orthodontic treatment one again. What is bruxism and why do I need a night guard? Bruxism is the forceful clenching and/or grinding of the teeth. In most people, bruxism is mild enough not to be a health problem; however, some people suffer from significant bruxism that can later become a problem. Bruxism often occurs during sleep and can even occur during short naps. Often, it can cause indentations in the teeth, wear of the biting surface and cracks in the teeth. People who suffer from bruxism will sometimes grind their molars (back teeth) together, which usually is loud enough to wake a sleeping partner. Given enough time, dental damage will typically occur. Teeth grinding is the significant cause of tooth loss. Most people are not aware of their involuntary teeth grinding, and some go on to develop symptoms such as jaw pain, ear pain and headaches. Unfortunately, there’s no known cure for bruxism. Ongoing management of bruxism is based on minimizing the abrasion of your tooth’s surfaces by the wearing of a custom fitted night guard, which is designed to the shape of your upper or lower teeth. A night guard is a custom appliance which prevents damage by cushioning the teeth. Although a dental night guard can be purchased over-the-counter, some guards cannot be custom fitted and may not be as effective. Because the guard is not fit specifically for an individual’s mouth, it may also be uncomfortable. How is a nightguard made? The process to fabricate a custom fitted nightguard is fairly simple. Dr Scopu, will take an impression of both your upper and lower set of teeth using an impression tray and a putty-like material. After the impressions are taken, our lab technician will pour liquid plaster into your impressions in an effort to make a mold of your teeth. After the mold is made, a piece of acrylic or soft laminate is heated and air suctioned to form around each tooth surface and crevice, thus the term custom fitted night guards. For the dental night guard to help reduce problems associated with teeth grinding, it’s important to wear it every night. Some people may eventually stop grinding their teeth overtime and the device won’t be needed. Children especially tend to outgrow teeth grinding. To maintain the device, it should be cleaned every time it’s used by brushing it with toothpaste and rinsing completely.